Harry Baker is a popular crab-apple, featuring intense dark-pink blossom in spring, and dark red fruitlets in the autumn. The fruits are quite large and have a red flesh, and this an excellent variety for making crab-apple jams and jellies. 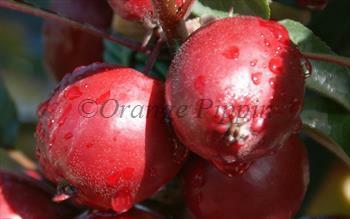 Please fill in the details below and we will let you know when Malus Harry Baker crab apple trees are back in stock. Fruit persistence: Ripens over a period? Malus Harry Baker is in flowering group 4. Malus Harry Baker is self-fertile and does not need a pollination partner, although fruiting may be improved if there is a compatible tree of a different variety nearby. Like most crab-apples it blooms over a long period and is therefore a good pollinator for other apple and cider-apple varieties flowering at the same time. Harry Baker is likely to reach 3m-4m on a semi-vigorous rootstock, and is a good pollinator for sprinmid and late-flowering apple trees. This crab-apple was named in honour of Harry Baker, Fruit Officer of the RHS at Wisley in the 1980s, and the author of several books on fruit trees and soft fruits.